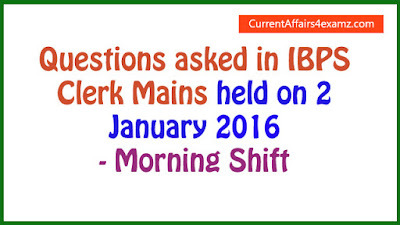 Hi Aspirants..Today (2 January 2016) was the first day of IBPS Clerk Mains 2016. In this post we are sharng with you the questions asked in the Morning Shift of today's (02.01.2016) exam & its Review. The Mains Exam consist of Reasoning, English, Quantitative Aptitude, General Awareness & Computer Knowledge. 40 questions from each section for a total of 200 marks. This will be useful for those having exams in upcoming shift & those preparing for next year's exam. From the first reviews received it is seen that English, Reasoning & Computer Sections were easy whereas Aptitude was little bit lengthy & from GA banking & current affairs questions were more - static gk were less. Stay connected for more updates. * No questions from quadratic equation, simplification questions were moderate, Data Interpretation question was easy.